I'm delighted to share with you one of my favorite lunches to pack when I'm on the go, in a class or workshop for the day or even for a date on the beach! 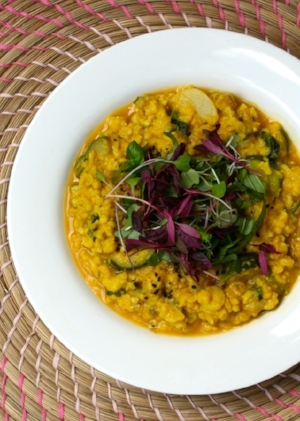 In the Science of Ayurveda, kitchari is a dietary staple traditionally consisting of rice and lentils. A lovely and nurturing meal that is usually prepared in a crockpot throughout the day or on the stove stop for around an hour. The exciting part about this recipe is it only takes around 10 minutes to prepare. 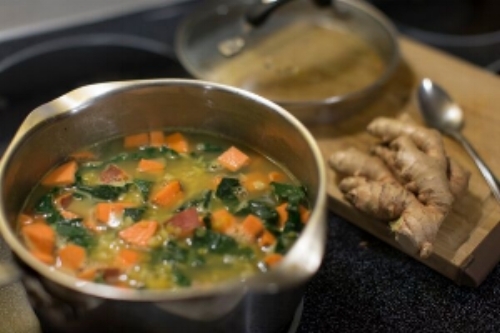 You'll be amazed by this hot, nurturing and delicious meal to go. Add more water for soupy kitchari. If you have a mini cooler or another small wide mouth insulated container, I enjoy gnashing the kitchari with cilantro, avocado, coconut yogurt and sometimes a curried sauerkraut. Strain and rinse rice and dhal. Melt the ghee in a large saucepan on medium heat. When it is hot but not smoking, add the cumin seeds. After the cumin seeds turn brown, add the shredded ginger. Add the turmeric and some freshly-ground black pepper (optional). Stir quickly. Add the rice and mung dhal. Add the water and bring to a boil. Boil vigorously, uncovered, for 5 minutes. Add the vegetables to the mixture. Boil uncovered for an additional 2½ minutes. Pack the thermos lunch, allow the Kitchari to continue cooking for about four hours. Enjoy your freshly-cooked hot meal – it will taste like it just came off your stove! Inspired from my studies with Maharishi Ayurveda. 2017-2018 © tulsi bagnoli. All rights reserved.